Quartz is the second most abundant mineral in Earth's continental crust. 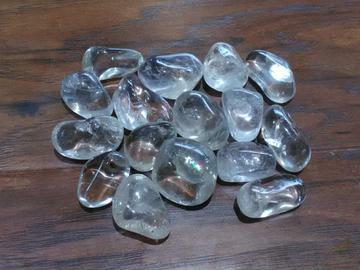 Clear Quartz is colorless and transparent or translucent. Quartz is a defining constituent of granite and other felsic igneous rocks. Clear Quartz is said to be the stone of power and amplifies any energy or intention. Clear Quartz protects against negativity, attunes to your higher self, and relieves pain. Stone sizes range from Small - 1/2"